The A283 has been partially blocked by a collision involving two vehicles, according to reports. The collision has reportedly happened northbound between the Shoreham flyover and the cement works on the A283 Steyning Road. 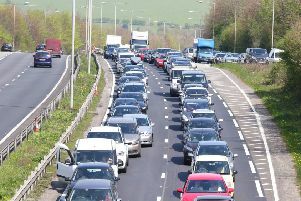 Traffic reports indicate slow traffic both ways from the A2037 Shoreham Road to the A27. Police are on scene directing traffic past the scene of the collision, according to reports. The road has been blocked and traffic is currently queuing.